4.4 out of 5 based on 49 bloggers and 16 commenters. 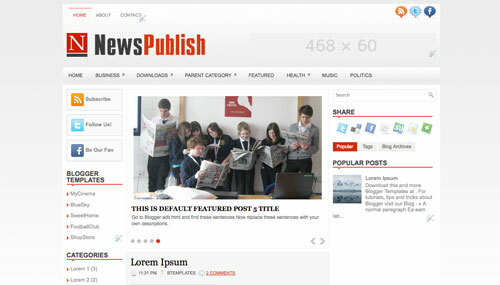 NewsPublish is a free blogger template adapted from WordPress with 3 columns, left and right sidebars, ads ready, footer columns, slider, social bookmarking icons, posts thumbnails and drop down menu. It’s a perfect template for my blog, but I like to change the slideshow and their pictures, please would you to describe me how to replace the slideshow on your template to mine, your reply will be highly appreciable for me and for my noble cause. Hi, I like the template but i have a question: if i download it, would it be possible to change the colors of the titles and change all titles in french instead than in english. And is it also possible to change de background (i would like to put a picture)? what are the ways to apply this template to my blog.Let me know. I am trying to get rid of the second blog section because it is showing up redundant on the site. Check out the about us page to see what I am talking about. Nice templete. Gonna use it on one of my blog. For my personal on blogger i would like to use this template. after a long searching this theme attracts my eyes. Thanx a lot for sharig such a nice template. I love blogging, blogger and templates. last time i upload this template to my blog and its work fine but now i want to use this template again but it shows the following error when i upload it . [We were unable to save your template. I download the fresh copy of the template too but error still the same what should i do pls help. Can anyone tell me how the hell can I change Read More text? My websites is Hungarian. Perfect template… tnx for this one..